You will earn 10,663 Reward Points. Earn 1 reward point for every 1 dollar spent. No. 3 Type Tray Slides To Accommodate (2) 12" x 20" Steam Table Pans, Adjustable To 2" O.C. 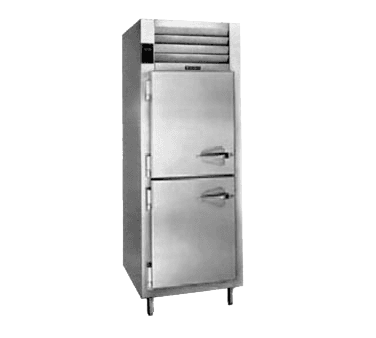 Cabinet exterior, including front, one piece sides, louver assembly and doors are constructed of heavy gauge stainless steel. Cabinet interior and door liners are constructed of stainless steel (anodized aluminum in the A-Series). Exterior cabinet top, back and bottom are constructed of heavy gauge aluminized steel. Adjustable 6" high stainless steel legs are included. Doors are equipped with removable plug cylinder locks and guaranteed for life cam-lift, gravity action, self-closing metal, glide hinges with stay open feature at 120 degrees. Hinges include a switch to automatically activate the interior incandescent lighting. Guaranteed for life, work flow door handle is mounted horizontally over recess in door which limits protrusion from door face into aisleways. Easily removable for cleaning, vinyl magnetic door gasket assures tight door seal. Anti condensate heaters are located behind each door opening. Cabinet and door contains high density, non-CFC, foamed in place polyurethane insulation. A top mounted, self-contained, balanced refrigeration system using R-404A refrigerant is conveniently located behind the one piece louver assembly. It features a plenum effect blower coil, large, high humidity evaporator coil located outside the food zone, top mounted non-electric condensate evaporator, and an automatic preset time activated electric defrost. A face mounted key switch is provided to convert operation from freezer to refrigerator mode. Standard operating temperature in freezer mode is 0 to -5°F. Operating temperature in refrigerator mode is 34 to 38°F. Operating temperatures are not adjustable. The water resistant digital microprocessor control is provided. It includes an 3-digit LED temperature display in addition to features such as a defrost lock-outs and indicator light. Both a one year parts and labor warranty and a five year compressor warranty (self-contained models only) are provided standard. An optional 2nd year extended parts and labor warranty is also available. In addition the microprocessor control is warranted by a two year parts and labor warranty.